This is a super moist and fruity traybake square, perfect for snacking, school lunch boxes or an evening treat. 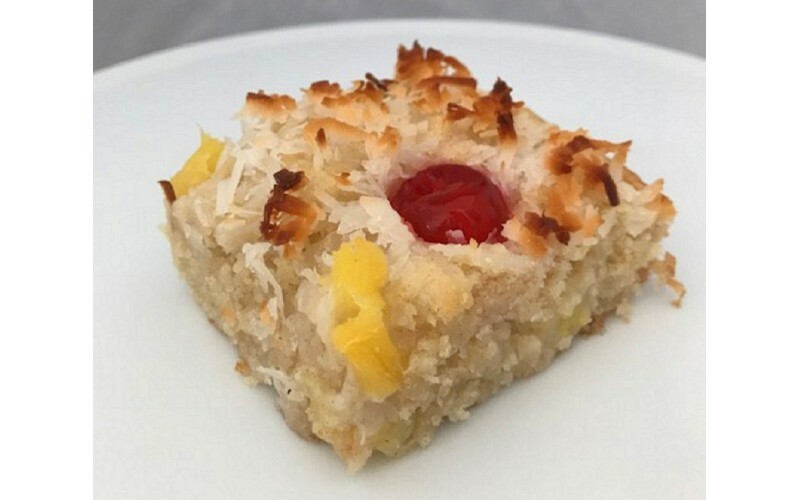 The sweetness of the cherry and coconut is a beautiful contrast with the tang of pineapple. Best of all, the ingredients are easy to get hold of and the recipe is just six easy steps. First liberally grease (or line with parchment paper) a 33cm x 23cm (13 inch x 9 inch) cake tin, set aside and preheat the oven to 180°C/350°F/Gas Mark 4. If you only have smaller trays, split the recipe across 2 trays or use half of all of the ingredients listed. Then in a large bowl combine the flour, sugar, bicarbonate of soda and 100g of the coconut. Stir well to combine. Add into the bowl the oil, coconut milk, pineapple juice, vanilla and 135g of the pineapple chunks. Mix all together until fully combined. Pour the batter into the prepared tray. Then add 100g more pineapple and 100g more coconut sprinkled across the pan. Lightly press in 15 glace cherries evenly spaced out across the pan. Cool in the pan and then slice and serve. Lasts about 3 days in an airtight container. Great to freeze for up to 3 months.